Blowout Sale! 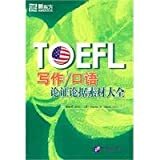 Up to 80% off on TOEFL & TOEIC at Translate This Website. Top brands include McGraw-Hill, Research & Education Association, Macmillan Education, Rockridge Press, Pearson Education ESL, MCGRAW-HILL Professional, Brand: Heinle ELT, BARRONS, Milet Publishing, Beijing Language and Culture University Press, HarperCollins UK, Barron s Educational Series, Kaplan Publishing, Barron's Educational Series, & . Hurry! Limited time offers. Offers valid only while supplies last.